The Golden Goat is back! Please join us on Sunday, April 22nd at Pacheco State Park for the 22nd Golden Goat. Pacheco is gorgeous this time of year​—​green rolling hills, scattered oaks, and blooms of wildflowers. The Golden Goat is a mass-start event, traditionally emphasizing long and hilly courses with some other deviations from traditional point-to-point orienteering. This year, four courses are available: Goat, Kid, Pygmy, and "Orange". This year the Pygmy is not a beginner course​—​it is more like a "Brown Goat" for advanced orienteers who would like a somewhat less physical goat experience. For intermediate orienteers, an Orange course will be available. Please note that there are no beginner courses at this event. Beginner courses will be provided at the other BAOC events on the schedule, and we hope beginners will attend those events. (*) Distances and climbs are without skips. The Goat and Kid start and finish at the assembly area. To relocate to suitable terrain, the Pygmy course has a remote Start and Finish 1.5–2 km from the assembly area. The Orange course uses the Pygmy Start and the Goat/Kid Finish. Note that this event has a non-standard schedule with mass starts. Everyone must return to the assembly area by 2:00 PM. The Goat especially travels a long distance from the Start/Finish​—​make sure you leave time to return! 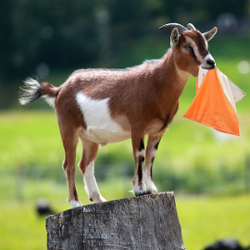 For Goat and Kid courses, there is a four-hour time limit. For the Pygmy course, there is a three-hour time limit. We will start picking up the first 13 of the Kid and Goat controls at 1:30 PM when the Pygmy closes. At 2:00 PM, all controls are game for pick-up. Standard rates apply for optional compass ($1) and E-stick ($5) rental. Note that the Goat requires a high-capacity E-stick (up to 40 controls). Please note that there is also a $10 State Park fee per vehicle for parking, paid with self-registration envelops on arrival. Awards will be presented to the first three Goat, Kid, and Pygmy finishers for each of several categories. The awards ceremony will take place soon after the awardees have finished. In addition, the top 15 finishers on the Golden Goat earn Golden Goat Lifetime Points. The current table of these points, and the rules for their awarding, are available here (PDF/85KB).
. Volunteers will also be enthusiastically accepted at the event. Pacheco State Park is a mixture of grassland and open forest, mostly oak, with a few pockets of dense chaparral. The Pacheco map is generally outstanding, with excellent contour, rock, and vegetation mapping. That said, the rocks at Pacheco can be confusing. Many features are somewhere between "cliff" and "boulder", "boulder" and "boulder pile", or "boulder pile" and "rocky ground". Also beware that some of the "large foot paths" marked on the map have almost disappeared in thriving grass, while cattle have added unmarked trails. The features mapped as "vehicle trail" (as opposed to foot path) are robust. Lone trees are represented with open green circles, whereas overlapping canopies are mapped white. There are a few places where lone trees have grown to overlap, and a few places where part of a white area has shrunk due to a fallen tree. Brown "×" symbols mark some, but not nearly all, fallen trees. The green "×" symbol is not used. Dark green corresponds to either thickets of thorny brush or impenetrable chaparral. A solid dark green dot is either a clump of thorny brush, sometimes massive, or a scrubby tree. When used as a control location, the "thicket" symbol is used for a clump of thorny brush, whereas the lone-tree symbol is used for a scrubby tree. A lighter green has been used to map buckeye groves or similar low-hanging trees through which it is more difficult to run; as of early April, these groves were sufficiently distinct to be suitable for navigation, although their shape and size may have changed a bit from when the area was mapped. Parallel green lines represent technically passible scrub, often sagebrush but sometimes poison oak; these scrub patches are easy to avoid and not advantageous to cross. The park warns visitors about both ticks and rattlesnakes. Although the course setter encountered neither, the usual precautions should be taken: long pants, gaiters, and watchful eyes both during and after the event. Cattle roam the park. While they generally run from humans, be mindful of their defense of calves, who are abundant this time of year. The course setter also observed wild pigs with piglets, and gave the sow plenty of space. Most of the park is free of poison oak, but it does appear near some potential routes. Generally it is quite visible​—​large, leafy, and green. Courses are long and often exposed​—​adequate sun protection is advised. There is no potable water in the park, so please come to the event with full bottles. Drinking water will be provided on the courses, at the remote Start/Finish, and at the assembly area. The Goat, Kid, and Orange courses cross fences in various states of repair. Roll under intact fences​—​this is better for the fence and safer for the participant. Some sensible route choices encounter fence segments with wires so loose as to leave obvious gaps; these fences may be crossed by passing through. Please be gentle with these older fences, and do not step on suspended wires when crossing. There is also at least one potentially electrified fence near a possible route choice for the Goat​—​it looks obviously different and is trivial to step over. The course setter did not test if it was actually electrified. The Pygmy course crosses one fence twice, with a highly-recommended route choice through a clearly-mapped gap. There is barbed wire on the ground, so please take care when passing. Participants may choose routes that encounter gates. Please make sure these gate are secured in their original state after passing through. Note: Be vary careful crossing Highway 152. The traffic is moving faster than you might think! The entrance to Pacheco State Park is between Gilroy and Los Baños on the south side of Highway 152, just west of Pacheco Pass. From most of the Bay Area: Take US 101 south from San Jose to Gilroy, and then Highway 152 east. Pacheco State Park is to the right just before the very top of the pass, about 10 minutes after the exit for Casa de Fruta. There is a large gravel lot (often used by trucks) on the right-hand side of the road that does connect to the park entrance; a superior route choice is the paved road to the park immediately after the gravel turnout. From points further east (Central Valley, Sacramento, Livermore, Antioch): Take Interstate 5 south to Highway 152 west. Pacheco State Park is a left turn (there is a turn lane) immediately after the top of Pacheco Pass.